Features early county configuration. Predates West Virginia. 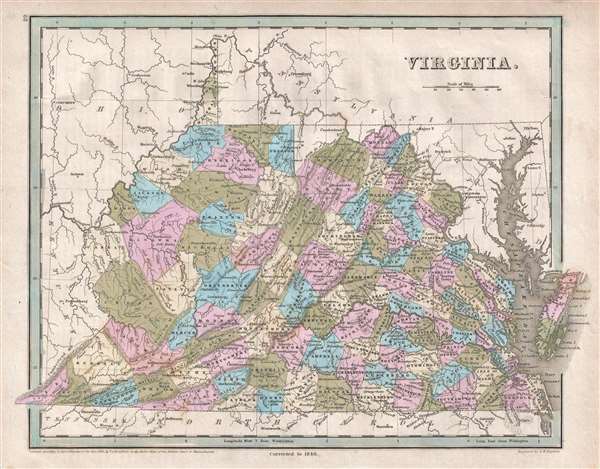 This is an 1846 Thomas G. Bradford map of Virginia and West Virginia. The map depicts the region from Ohio and Kentucky to the Chesapeake Bay and from Pennsylvania and Ohio to Tennessee and North Carolina. Highly detailed, each county is labeled and shaded a different color for easy differentiation. Myriad cities, towns, and villages are labeled, along with rivers, mountain ranges, and other physical features. The entire Chesapeake Bay is illustrated, along with rivers and cities in Maryland. The District of Columbia, or Washington D.C., is also depicted.